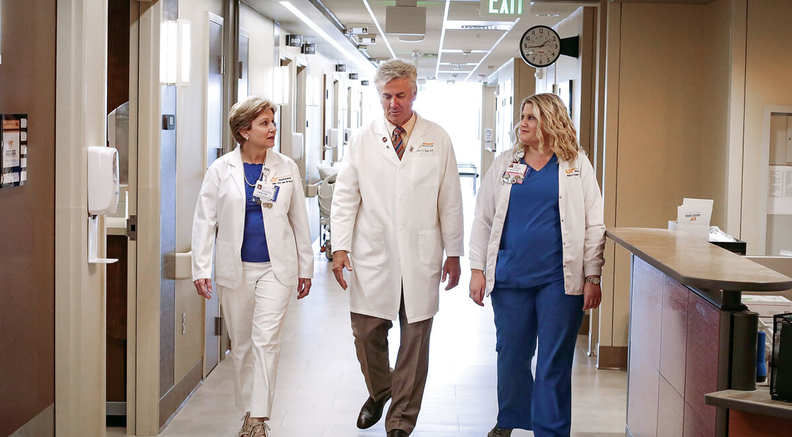 Janell Cecil, Dr. Jerry Epps and Jessica Flanary (left to right) lead a controversial program at the University of Tennessee Medical Center to combat drug addiction. Almost a year ago, the University of Tennessee Medical Center in Knoxville started requiring addicted patients admitted for medical treatment of drug-use associated infections to submit to tough new conduct rules. They must agree to a search by security, turn over their clothing and all personal property, hand over their cellphone, not leave the hospital floor, and receive no visitors. If they won't sign an agreement to follow those rules, they must leave. UTMC leaders say the policy, approved by the board of governors and implemented last August, was necessary to keep patients and hospital staff safe, and support nurses and other staff who were feeling burned out in dealing with these often-challenging patients. They say the approach has improved staff attitudes toward these patients and led to better care. The policy was inspired by a similar, though more flexible, program started four years ago at Providence Regional Medical Center in Everett, Wash. Vanderbilt University Medical Center in Nashville says it's considering adopting a similar protocol. In the midst of the nation's spiraling substance abuse epidemic, many hospitals around the country are struggling with how to handle the surging number of patients coming for treatment of medical problems associated with chronic drug use. There's wide agreement that these patients sometimes bring a host of problems into the hospital—illicit drugs, unsavory associates, defiant attitudes, bad personal hygiene, crime, chaos and the threat of overdose deaths. Everyone is scrambling to figure out how to offer them the best care while protecting staff and other patients. But UTMC's policy, which experts say may be the strictest in the country, has sparked a sharp debate about its ethics and therapeutic effectiveness. A number of doctors who treat drug-addicted patients call it a harsh and counterproductive way to handle people with a chronic, relapsing illness. UTMC leaders admit that a significant number of patients have not responded well to the new policy, which some see as forced detox. About 42% of the 343 patients admitted since August for treatment of drug-use associated infections—including osteomyelitis, endocarditis, sepsis and soft-tissue infection—have left the hospital against medical advice before completing their antibiotic treatment. A key split between the two camps is over acceptance of addicted patients continuing to possess and use illicit drugs while receiving hospital treatment. The UTMC approach requires patients to give up all illicit drugs during their hospital stay and rely on pain medications and withdrawal management drugs such as methadone and buprenorphine provided by the hospital. “If they choose not to accept the plan of care, they have to leave,” Epps said. The alternative view is that addicted patients will find ways to continue using, and that it's best to openly discuss that and partner with patients to reduce the chances of harm and increase the odds of successful medical treatment and recovery from addiction. Graham said it's essential to educate staff to reduce biased and stigmatizing attitudes toward drug-addicted patients, which he thinks is what produces policies like UTMC's. Further complicating the handling of these patients is the difficulty of treating them for pain arising from drug-use associated infections, given their high tolerance for narcotics and the risk of their misusing those medications. UTMC and Providence Regional, for instance, administer pain meds in liquid form to prevent patients from hoarding tablets and using them to shoot up. Another challenge is that the most effective way of administering intravenous antibiotic treatment for infections is through a peripherally inserted central catheter line. Clinicians worry that patients will inject illicit drugs through the line in a nonsterile way, risking new infections and overdose. Thus, clinicians must decide whether to forgo use of a PICC line, or take precautions to reduce the risk of misuse of the line, particularly if patients leave before treatment is completed and antibiotic treatment must be continued on an outpatient basis. Providers can either put a lockbox on the PICC line or switch patients to oral antibiotics. Epps said he first learned last year about the severe problems UTMC staffers were having with patients being treated for infections associated with drug use when he was developing a new clinical protocol for standardizing pain treatment. He found out about the large amount of drugs and paraphernalia being confiscated by security, the verbal abuse staff endured, the drug deals taking place, and the lack of consistency in the plan of care for these patients. Some nurses were making moral judgments about those patients that were affecting their care. He feared nurses were feeling overwhelmed and would start leaving. After multiple meetings with physicians, nurses, other clinical staff, security and administrators, Epps crafted a plan of care for patients to sign, modeled on a patient contract used by Providence Regional. The goal was to have everyone present a united front, so patients couldn't play individual doctors and nurses against each other. That care plan has been modified over time, for instance allowing patients to earn back certain privileges—such as being allowed to have a cellphone and leaving the hospital floor for an outdoor break—based on good behavior. The policy has been extended to drug-addicted patients who are admitted for reasons other than infections. But Epps acknowledges that major challenges remain, particularly getting patients into addiction treatment after discharge. That's a big problem in Tennessee, which hasn't expanded Medicaid to low-income adults, making it harder to find a payment source for an extended course of residential medication-assisted treatment. Some patients respond angrily when asked to sign the written plan of care, he said. They often leave as soon as they find out they can't have visitors. Or they may stay only two or three days until their abscess is drained and they feel better, even though most patients need three to six weeks of IV antibiotic treatment to cure their infections. Arthur Caplan, director of medical ethics at the NYU School of Medicine, said he could accept short-term restrictions on the autonomy of addicted patients if that increases success in treating this difficult population. Yet he doesn't see it as an ethical way to treat patients outside of mental health settings. Still, he views such a restrictive policy, which he hasn't seen at any other acute-care institution, as a research program that should be evaluated based on treatment effectiveness. UTMC's 42% rate of patients leaving against medical advice seems high to him. “If you come up with a very tough treatment policy, and only about half the people sign it or complete it, my hunch is it won't take us to where we need to go with that population,” he said. Martin Green, immediate past president of the International Association for Healthcare Security and Safety, said he's seen similar approaches in mental health facilities but never in an acute-care hospital. But success with these patients is iffy no matter what approach providers take. UTMC's Cecil cited as a success story a patient who received antibiotic treatment for a drug-use associated infection under the new conduct rules, got clean after leaving the hospital, and returned several times to visit and thank the nurses. “That makes it all worthwhile,” she said. RELATED STORY: Docs argue for safe-injection sites for illicit drugs in the U.S.